Navratri is one of the most celebrated festivals of India. Nav translates to ‘Nine’ and Ratri to ‘Night’ therefore meaning nine nights that are dedicated to the Divine Mother in all of her forms. Navratri Festival Celebrations devotees are welcoming Goddess Durga for nine days. The celebration lasts for nine nights, or as many days. The tenth day is celebrated as Vijayadashami , wherein devotees immerse idols of Goddess Durga into the water. This year Navratri which started on October 1 will be on till October 10, with 11th being Dussehra. It is also known as the Maha Navratri and the most important day. The nine forms of Goddess Durga is said to symbolise creative energy and the feminine body. Each form of the goddess has its own day dedicated to it. Categories: Bhakti, Spiritual, Yoga info | Tags: Durga, Navratri | Permalink. Navaratri is one of the most celebrated festivals of India. Nav translates to ‘Nine’ and Ratri to ‘Night’ therefore meaning nine nights that are dedicated to the Divine Mother in all of her forms. The Mother Goddess is said to appear in 9 forms, and each one is worshiped for a day. These nine forms signify various traits that the goddess influences us with. The Devi Mahatmya and other texts invoking the Goddess who vanquished demons are cited. 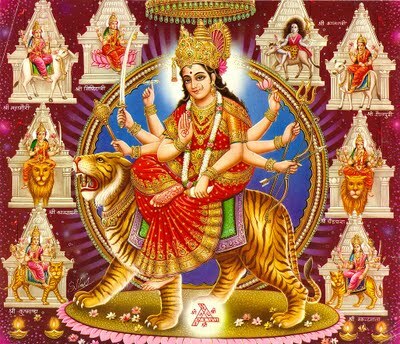 The first three days of Navaratri are dedicated to Goddess Durga (Warrior Goddess) dressed in red and mounted on a lion. Her various incarnations- Kumari, Parvati and Kali are worshipped during these days. They represent the three classes of womanhood that include the child, young girl and mature woman. Next three days are dedicated to Goddess Lakshmi ( Goddess of Wealth and Prosperity), dressed in gold and mounted on an owl and finally, last three days are dedicated to Goddess Sarasvati (Goddess of Knowledge), dressed in milky white and mounted on a pure white swan. Ashtami, Navami and Vijaydasami which is on the 9th day are celebrated as Sarasvati Puja in which books are worshipped. The books are placed for Puja on the Ashtami day in own houses, traditional nursery schools, or in temples. On Vijayadasami day, the books are ceremoniously taken out for reading and writing after worshipping Sarasvati. Vijaydasami day is considered auspicious for initiating the children into writing and reading, which is called Vidyarambham. Tens of thousands of children are initiated into the world of letters on this day. Categories: News, Spiritual | Tags: Durga, festival, goddess, Hindu, Navaratri | Permalink.